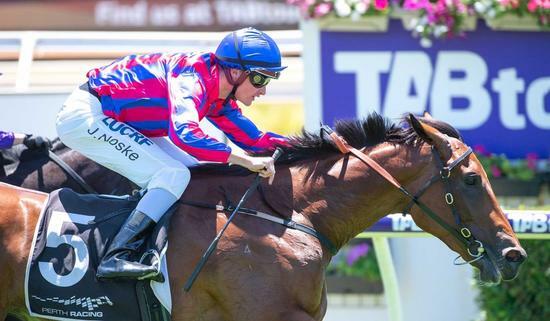 Trainer Trevor Andrews is confident his talented filly Miss West Coast can justify hot favouritism and continue her march towards rich juvenile races at Ascot on Saturday. Andrews says Miss West Coast had improved since her maiden victory three weeks ago and expects another strong showing in the David Gray’s Aglink Plate (1100m). “I have stepped up her work and she is in good order,” Andrews said on TABradio. “She is doing really well in the stable and the feed bin. Miss West Coast, bought for $145,000 a year ago, ran a narrow second to Amarillo Rose when on debut last October. Last-start she raced keenly in the early stages of her race before finishing strongly to chase down the leader Drinkwahtyoulike. Andrews said Miss West Coast’s first win displayed promising signs. “She raced a bit fresh when first-up, but has probably come back to earth a little bit since that win,” Andrews said. “She was entitled to get beat, she did a fair bit wrong, but her class got her through. “She was a victim of circumstances at her first start when she was slow away. “I would like to see her relax a little bit better if she doesn’t begin too well. In a field of eight runners, Miss West Coast, a daughter of Safeguard, has drawn barrier one. Jarrad Noske keeps the ride. Andrews says he expects Miss West Coast to be in a prominent spot in running. “We’ll go forward and take it up or be running second,” Andrews said. Miss West Coast is the clear $1.75 with TABtouch. Eye Of The Day ($4.40), debutant Tajmali ($4.80) and Red Can Man ($6.50) round out runners in single figures. Andrews said if Miss West Coast ran to expectations she would progress to the Magic Millions WA 2YO Classic (1200m) at Pinjarra on February 9. “That’s the plan, the Magic Millions in a couple of weeks,” Andrews said. “It’s all exciting for the connections, barring anything going amiss. Andrews is the most successful trainer of the Magic Millions 2YO Classic, winning the race on four previous occasions with Ravinia (2006), Time To Climb (2010), Lucky Street (2015) and The River (2016).